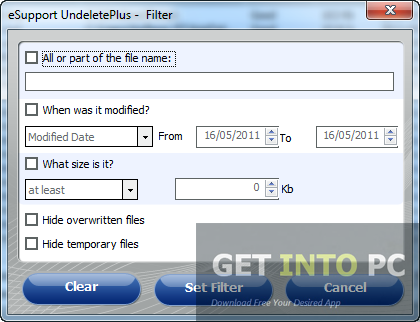 Undelete Plus Free Download Latest Version for Windows. It is full offline installer standalone setup of Undelete Plus Data Recovery software for 32/64 bit. There are times when you delete some of your files and then realize later that you actually needed them. Sometimes you accidentally delete the files and folders and then later realize a catastrophe has happened. To reverse all of this and for preventing the hazardous effects of such catastrophe there are many recovery tools available and among many of them is Undelete Plus. 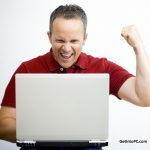 Personally i use Easeus Data Recovery Wizard Pro which is great data recovery software. The interface of Undelete Plus is very simple and sleek and it contains all the tools for recovering the lost files with ease. Once an object is shift-deleted it is considered to be wiped out of the system but you can get it back within no time with Undelete Plus. When you need to recover a specific file you have to search it by typing the file name. You can set a filter which will filter out all the other files and will come up with the one you are looking for. After this you can start scanning process. Once the scanning process is complete you will have a nice looking list with all the missing files. Power Data Recovery is another great alternative. The restoration process is very quick and the you can recover the lost files with just a few clicks. All types of files ranging from audio, video to simple text files. The files from removable media can also be recovered hence any data loss from USB, Memory card or Camera cards can be easily recovered. Though the program is very easy to use but if there is any problem in operating the tool there is a comprehensive help file available which will give you hints on every step for efficient working. All in all Undelete Plus is a very productive tool that can restore all the lost files. An easy to use tool which can be used by novices as well as professionals with ease. Below are some noticeable features which you’ll experience after Undelete Plus free download. 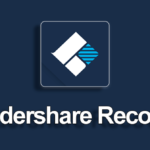 Can recover all the lost files easily. Can set filter for finding specific files. All sorts of files can be recovered. Files from removable media can also be recovered. Before you start Undelete Plus free download, make sure your PC meets minimum system requirements. 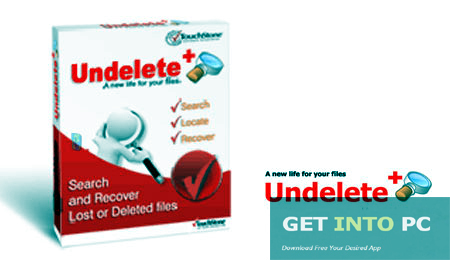 Click on below button to start Undelete Plus Free Download. This is complete offline installer and standalone setup for Undelete Plus. This would be compatible with both 32 bit and 64 bit windows.